Ok this project is super laborious but I am not sure I care. The end result is too fabulous to cry over spilled milk here, folks. Look at this. The texture is nutso. I. Die. This DIY had us at Kate Spade inspired. 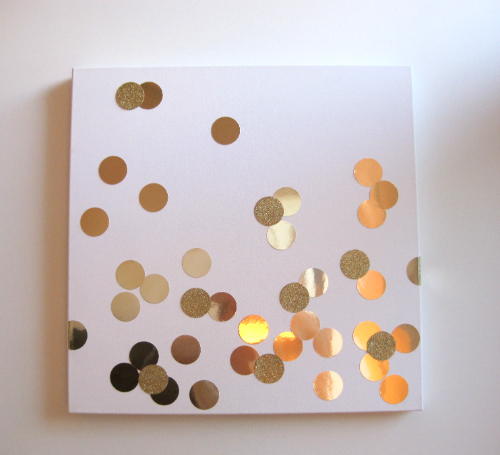 We have loved this gold polka dotted piece of art since the day we laid our greedy eyes on it. Gold, sparkles, polka dots. What is not to love here? Holy. Statement. Never ever would I have thought of doing this, until now. 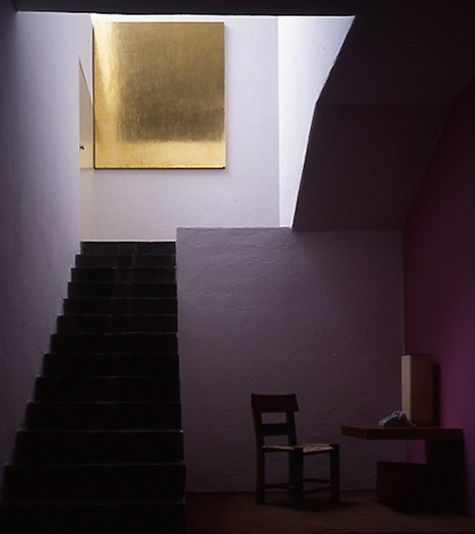 What an impact a solid gold piece of art makes. Bling. Bling. 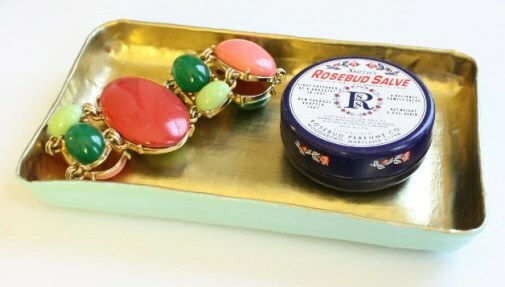 Super lovely gold accent tray to hold all of your favorite knick knacks. The end result looks so regal that you cannot believe it was a DIY. My Rosebud Salve would LOVE to lay his head here at night. Super fun spin on a wooden tray. We love this for cocktail or dinner parties. 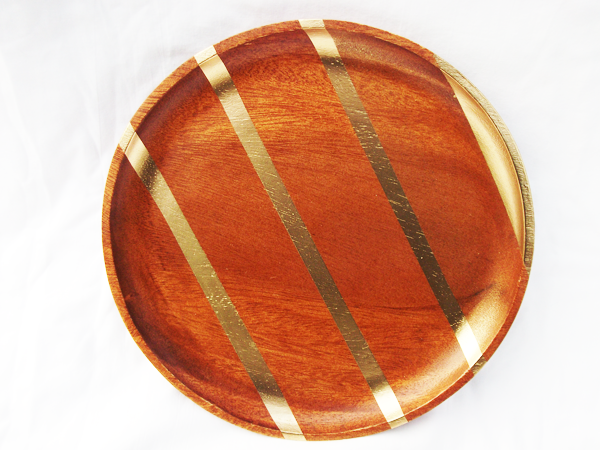 Super easy project that only requires tape and gold spray paint. Sounds RIGHT up our alley. 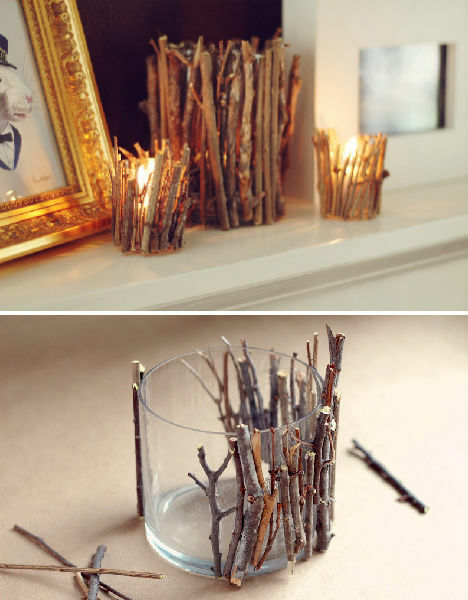 Who would have ever thought that sticks would be a glamorous accessory for your candlelight? We sure wouldn't have. Its amazing that such an earthy and organic element can add such class and pizzaz to any piece. Again, super simple DIY. Literally. Go pick up sticks. Literally. To make it a little more festive, spray paint your sticks gold. Why not? 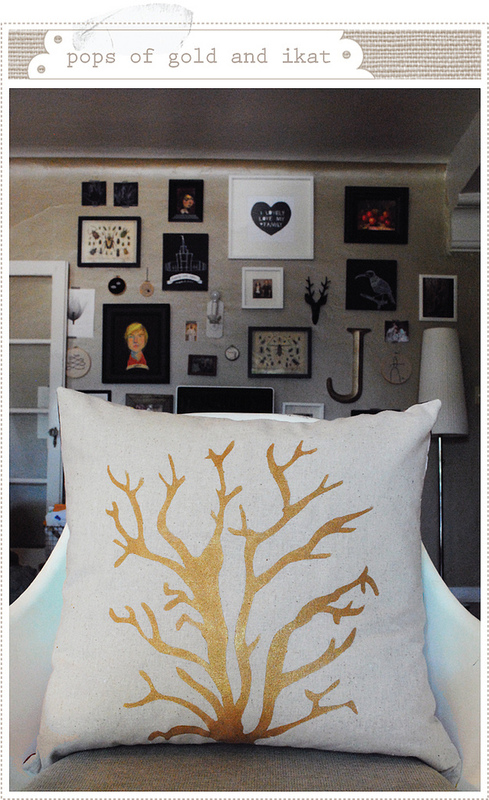 Love, love, love this pillow for any day but especially with the holiday seasons coming up. We could even see tracing a deer head onto a white canvas pillow and doing the fill in with gold paint. Adore! Ok so this isn't gold, yet. 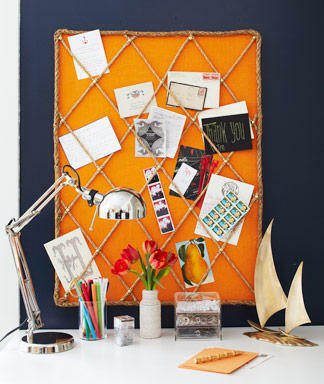 I totally need a new pinboard to display fabrics, inspiration etc. I am totally leaning to this. It is unique and definitely funky, but to repel from the overall nautical theme, I think some sort of gold rope/twine is going to be incorporated in my diy. What do you all think? Sooooo...next week on S+S. We can't tell you. You are not old enough. You will just have to come back and see what is going on. Just a little smidge of a hint. It is S+S's 1st Birthday next week and to celebrate we are rewarding our readers. In a big way. Big, big way. Cannot wait to share with you all! Happy, happy weekend. You girls seem to be loving gold as much as me! Great round up. I am also dying over that fish scale art! Oh wow, you posted my Fish Scale Wall Art! HUGE thanks to you, I am flattered!!! Love all the gold. Great round up of fun DIY projects! 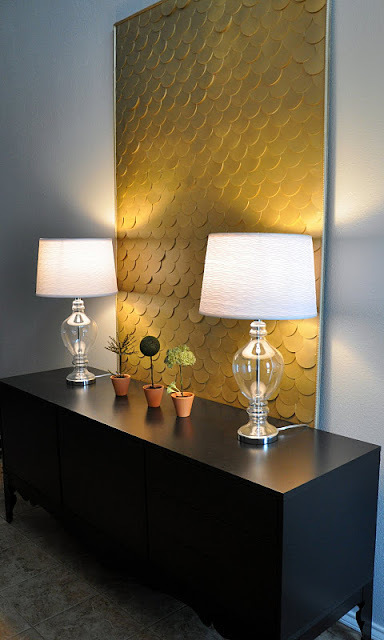 That fish scale art is amazing, so glamorous and luxe! Many great sources of inspiration here, wishing you a great weekend! Love this list! I have a couple on my to-do list :) Also, just stumbled across your blog and I am a new follower! I have to try that gold spraypaint tray! I LOVE the stripes. Thank you for including me in such a great roundup of projects! S+S Birthday Week: MF Creative Designs Giveaway! S+S Birthday Part Deux: Furbish Giveaway! Happy Birthday S+S! Leif Giveaway!